Okay, time to get down to business. The eye makeup remover has cornflower water and vitamin B in it, and is very gentle on your delicate eye area. It works just as well as any eye makeup remover and does not leave behind any oily residue. It is also not drying. The cleanser is described as a cleansing milk, toning lotion, and makeup remover. The instructions say to dab it on with a cotton pad OR smooth it directly on skin and rinse with water. I tried both ways and I prefer the cotton pad method. It is VERY effective at cleaning off makeup and it leaves your skin feeling super soft afterwards. I LOVE this cleanser for nights when I'm too lazy to actually wash my face. The first cream claims to provide moisture for 24 hours. This claim seems to be true, but I do not suffer from dry skin all that often, so it is hard to say how accurate my observation is. I do like the level of moisture it provides, though. It is not too heavy or too light, even for my oily skin. I typically wear it under my tinted moisturizer on a day when I feel like I need a little extra moisture, and I will wear it alone on days that I choose not to wear makeup. The night cream is much heavier. It claims to have anti-wrinkle and firming properties. The main ingredient, Rhamnose, is a plant-derived ingredient that helps the skin renew itself. I really only use this one when I am fighting dry, flaky patches on my cheeks and chin. I definitely only wear it at night because it makes my face oily almost instantly, and I avoid over-using it because the extra oil can make me break out. For those of you without oily skin, it would make a great nightly moisturizer! And there you have it. Wasn't that fun? Thanks so much for stopping by! Today I have an attempt at some freehand nail art. A favorite nail blog of mine has great tutorials... and I am fairly pleased with how mine turned out. I could definitely improve my technique a little, and maybe choose a different color combo so it stands out a little more, but I think it looks pretty dang good for my first attempt! The orange color, Sun Kissed, needed three coats. It applied a little streaky and blobby, but it smoothed over after a good top coat of Seche Vite. On my accent finger, I applied two coats of Lightening, then I used a small paintbrush to do the cloud designs. You can visit Nailside's blog to view the tutorial. That's all I have for now! Thanks for stopping by. I wasn't really quite sure how to tackle this topic, but I finally ended up just asking a few friends how they handle it and spent some time with my buddy, Google. I eventually came up with a few tips and tricks to help those of you who battle the static frizzy mess on a regular basis. First of all, I think it is important for you to know what causes static in our hair. It may seem like common sense to most of you, but I'll pretend like it is not. Without going into a lot of detail about electrons and pH balance, the main thing you need to know is dry hair and dry air are very conducive to static electricity. Winter is the worst because the air has less moisture in it, therefore it is more difficult to keep your hair hydrated. ALWAYS condition your hair! I understand those of us with oily hair might want to avoid the conditioner sometimes, but be sure to at least get some conditioner on the ends of your hair. ESPECIALLY during the winter. If you need to, avoid the roots and that can help prevent your hair from getting as oily. If you can manage, avoid washing your hair every day. The more you wash, the more it dries your hair. If you have an oily scalp like mine, you can use the product I reviewed HERE to make your hair last a second day without washing. Look for styling products that are WATER BASED and avoid those that are petroleum based (waxes, gels, & pomades). Use hairbrushes and combs made with natural bristles. Apparently those with plastic/synthetic bristles tend to make static worse. When styling your hair with blowdryers and straightening irons, be sure to use a thermal protection product. Spray a finishing spray on your hairbrush and then brush it through your hair. This is great before styling or even later in the day. After styling your hair, it is also not a bad idea to spray the finishing spray directly on your hair. Getting a humidifier in your home should help. This is the first year I have had a humidifier running all day, every day and I seem to have had fewer issues with dry skin and dry hair. I wouldn't recommend rubbing dryer sheets on your hair or spraying your hair with Static Guard. Multiple websites have warned that both of these have chemicals in them that aren't healthy for skin and hair and they could cause you to break out. With that said, I use both of these products on my clothes and the clothes touch my skin and I seem to do fine. So I say if it works for you, go for it! Sorry for the long-winded post! I think that covers just about everything I could come up with. 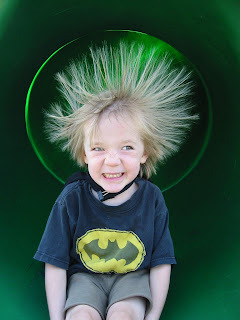 PLEASE feel free to comment below and let me know any tips you might have for preventing static hair.